Berlin became the capital of the united Germany in 1871, and Odo Russell was appointed the first British ambassador. Upon arrival, he moved into the apartment that the former ambassador to the North German Confederation, Lord Loftus, had leased from Count Arnim on the corner of 137 Leipzigerstrasse and 12 Leipzigerplatz. Russell found it totally unsuited to the new circumstances. Over the next few years, and to Russell’s infuriation, the Treasury was adamant in its opposition to finding money to buy a different house, or to build a new one, although a fair number of suitable houses was offered to Russell. Eventually, in 1875, with the inherited Arnim lease approaching its expiry, the Office of Works sent a consultant surveyor, Charles Stephenson, to Berlin to report on the accommodation opportunities and costs. By then, a splendid mansion known as the Palais Strousberg, at 544 Dorotheenstadt (later re-named 70 Wilhelmstrasse), was available for lease. It was built by Bethel Henry Strousberg, a railway magnate, to designs by August Orth and completed in 1868. Strousberg’s business failed dramatically in the early-1870s, and the ownership of his mansion passed to the Dukes of Ujest and Ratibor. Stephenson attested to its suitability for leasing for the British embassy. The owners agreed to undertake various works, and a ten year lease was accordingly negotiated, with some difficulty, to run from 1876. It is unclear whether it was one of the intended works, but a ballroom was designed by Orth in 1876 to replace the former Garden Room in the south-west corner of the site, and constructed early in Ampthill’s occupation. Since London would not have countenanced paying for the ballroom, it is a fair surmise that it was paid for by Gerson von Bleichroder, the banker at the heart of clearing up Strousberg’s business debris who had a close relationship with the ambassador and the British in Berlin. 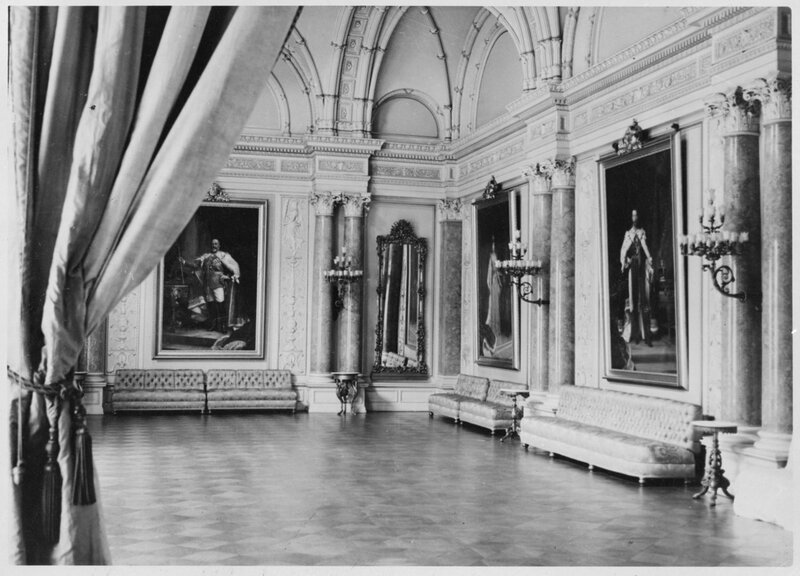 In any event, this ballroom greatly increased the representational effectiveness of the Palais throughout the next half century of heavy use. Seven years into the Palais Strousberg lease, in October 1883, Lord Ampthill, as Russell had become, told Earl Granville, foreign secretary, that the Duke of Ujest was now the sole proprietor of the house and proposed to dispose of the freehold, for the £64,375 that it had cost him, and wanted to give the British government first refusal. The Treasury asked the Office of Works whether purchase was really worthwhile given that the lease still had three years to run. The First Commissioner sent Robert Boyce, the Office’s principal architect and surveyor for civil buildings overseas, to Berlin to advise: he reported in December 1883. He thought the house was suitable for purchase: its splendid collection of formal reception rooms more than compensated for its insufficient stabling and lack of any garden. But he believed it would be cheaper to acquire a site and build a suitable new house on it. Among the several sites that he saw, there was one in Tiergarten that particularly appealed to him. He therefore concluded that, unless the Duke’s price came down to £50,000, buying a site and building a new house would be a more economical course than buying the Palais Strousberg. The Duke declined to accept £50,000, so the Treasury authorised buying the identified site in Tiergarten and building on it, all within £50,000. Ampthill objected strongly, compared the Palais favourably with alternative houses, and pointed out the drawbacks of the proposed site. Concurrently, he worked on the Duke and achieved a £3,000 reduction of his asking price, but he was worried that other prospective purchasers were closing in. After a while, the First Commissioner over-ruled Boyce’s advice and supported purchase to the Treasury, though warning about expensive improvements that would need to be made to the sanitary arrangements in the house. The Treasury agreed to drop the idea of the Tiergarten site and authorised the purchase of Palais Strousberg. Ampthill had prevailed, but he died three months before the purchase deed was signed at the end of November 1884. The British government bought his State room furniture from his executors for about £3,300. The cost of upgrading the building, including the sanitary arrangements and more furniture, all exceeded estimates, and the Treasury complained of these excesses in putting the house to rights. Russell had been unprepared in 1876 to accommodate the chancery offices in the Palais as usual in large mission houses, and instead rented a suite of rooms close by on Pariser Platz. Under pressure from the Office of Works, his successor, Sir Edward Malet, agreed that the chancery should be found space in the house and the Pariser Platz lease was terminated. Conversely, the stinks from the stabling in the basement grew steadily worse and in 1886 the Treasury gave permission to purchase off-site stabling. The Palais stood empty throughout the First World War, apart from a caretaker and a Dutch diplomat after The Netherlands became the protecting power, and was relatively unscathed. But its central portion suffered some damage during the revolutionary upheavals from a fire on 6 December 1919, which the Office of Works repaired before an ambassador, Lord d’Abernon, returned in 1920. By the time of the arrival in 1937 of Sir Neville Henderson as ambassador, the embassy had swelled to about one hundred staff. Their offices crowded both Palais Strousberg and a separate consular building, and the distance between the buildings was both a time-waster and a security risk. Crowds outside Hitler’s Chancellery, also on Wilhelmstrasse, often made approach to the embassy difficult. Henderson soon began lobbying London for larger premises in a more convenient area but, unsurprisingly, his pleas fell on deaf ears. He later narrated that he had relayed his ideas for a large new site for both offices and residence to Goering and Ribbentrop and asked them to acquaint Hitler with his thinking. That came to nothing either. 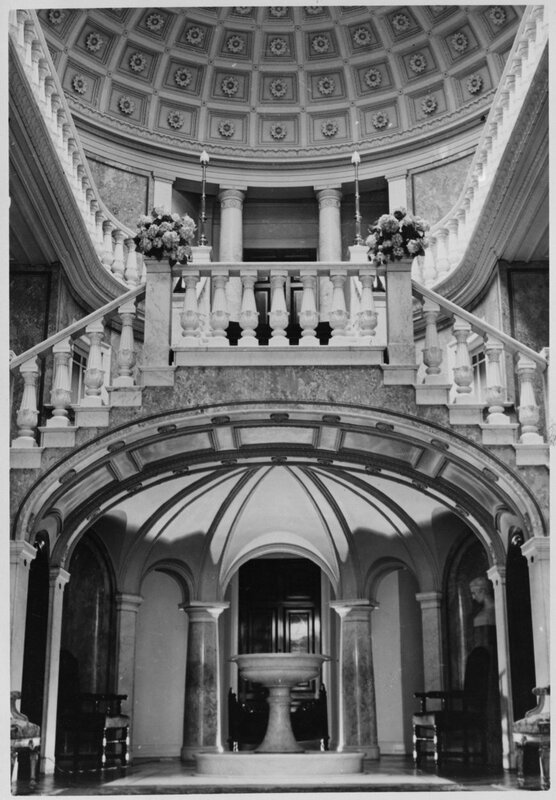 Palais Strousberg was again vacated, as 25 years earlier, just before the outbreak of the Second World War and handed to the United States embassy for protection. The caretaker, Rueger, and his family lived in it until it was almost completely destroyed in Allied bombing raids during the nights of 23 and 25 November 1943. Since the early 1900s, pressure had been building for more space for offices in the Palais Strousberg. Extending into the former stables areas and elsewhere had helped prior to the First World War but, after it, the pressures became impossible. In consequence, the large villa at 17 Tiergartenstrasse was bought in 1921 for about £7,500 from Captain Ulbo Kob to house the consulate, commercial staff and service attachés. This more or less held the fort until the outbreak of the Second World War, when the Tiergartenstrasse building was also handed to the United States embassy. It was destroyed during a night air raid on 22 November 1943. I am indebted to Julia Toffolo for her help with this entry: her comprehensive history of the Berlin embassy awaits publication. 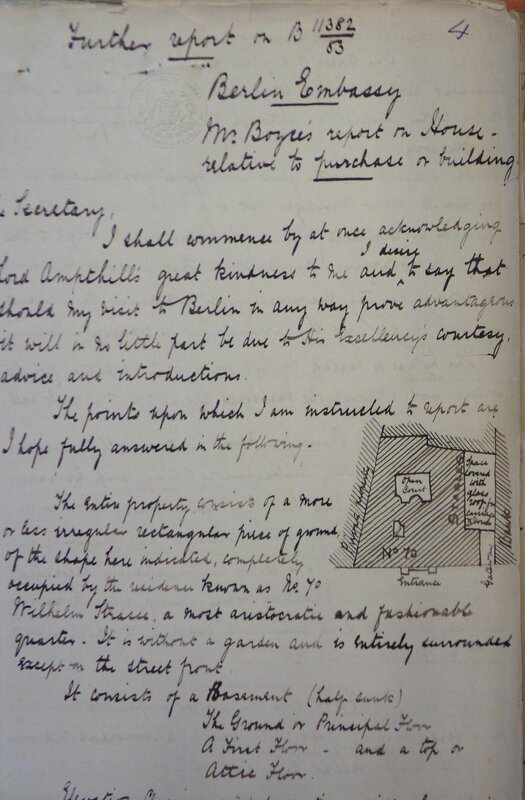 Robert Boyce’s 1883 report on Palais Strousberg, with sketch showing tight site. 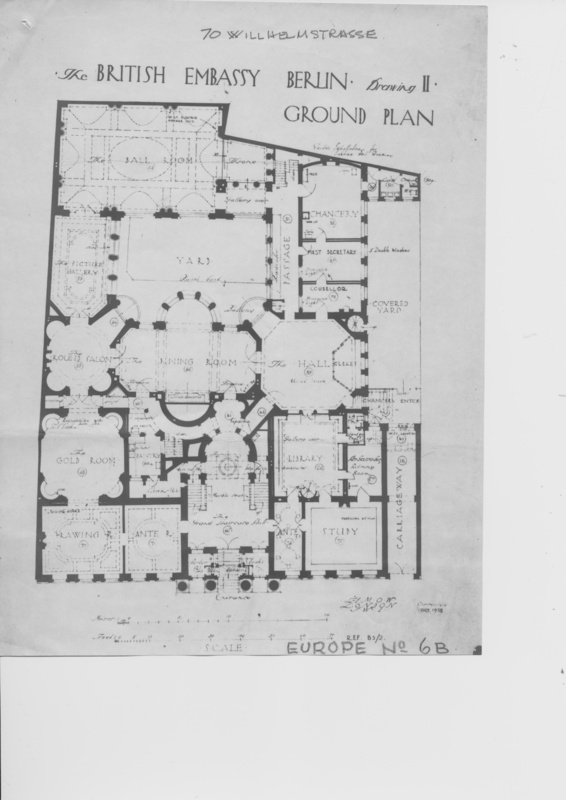 Ground floor plan of Palais Strousberg, corrected October 1938. 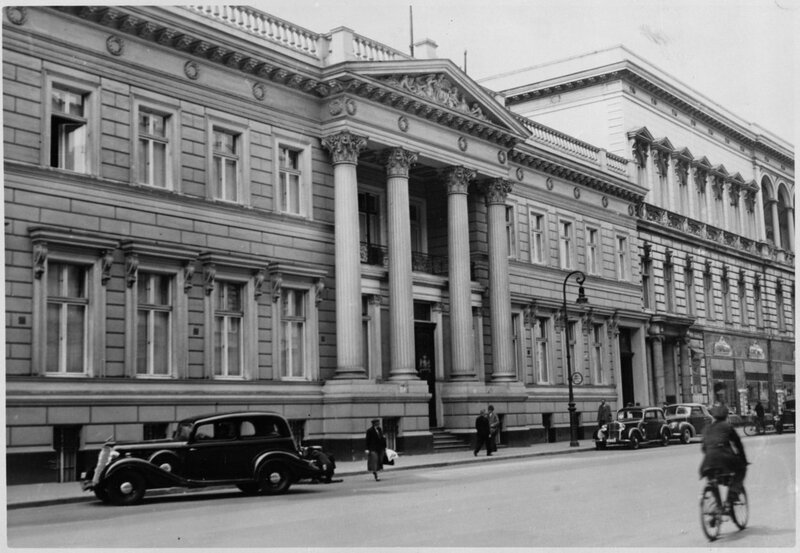 Streetview of Palais Strousberg, 1930s. Grand Staircase Hall, looking towards the dining room. 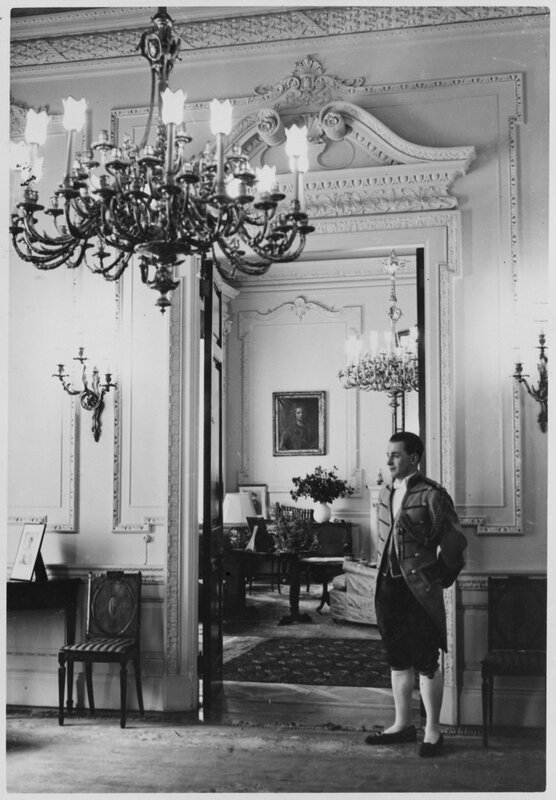 Footman on duty beside an ante-room.